Welcome to my new series, the 2017 Gift Guide! Get ready for more this holiday season. I cultivated a bunch of items perfect as stuffing stuffers, or smaller gifts for hostesses. For the trendier girl who loves anything from coffee in the morning, to cozying up inside wrapped in cashmere, these stuffing stuffers are perfect for them. How cute is this Darling Mug?! I love how it is oversized, for that extra space for whipped cream. These Faire Isle Socks bring all the holiday cheer. I find that they're the perfect winter sock that doesn't slip off when wearing boots. Traveling during the holidays would be less of a pain with cute accessories such as this Luggage Tag. I'm all about bows this holiday season, how chic is this Velvet Hair Tie?! These are good at any time of the year, but personally I think they're the cutest gift. Stock up on some Rosé Gummies. As a hostess gift or stocking stuffer, these Wine Goodie Bags are so fabulous. 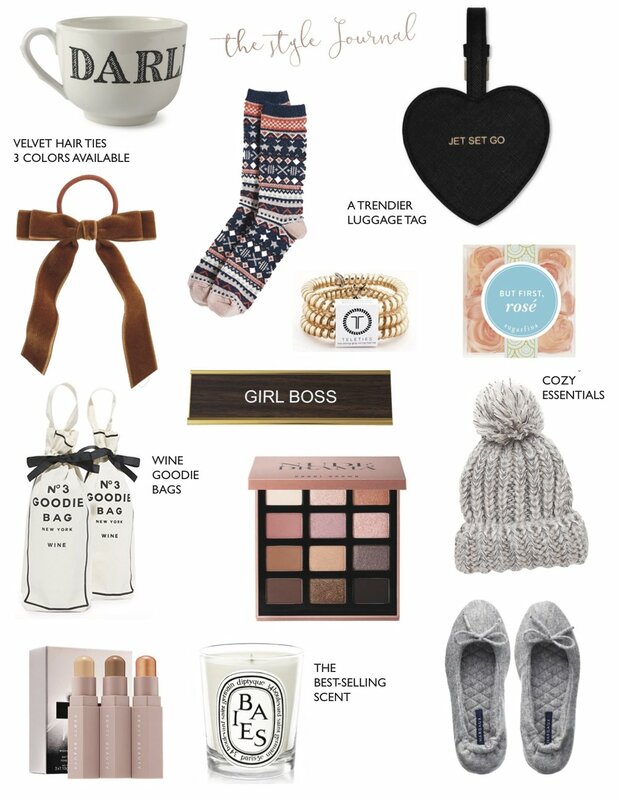 Inspire with this Girl Boss Nameplate, the perfect desk accessory. We can never have enough Pom Pom Hat's - especially in frigid temperatures. This Bobbi Brown Palette is a makeup lovers essential. Get it now before the price goes back up. For a more trend makeup lover, the Fenty Beauty Contour & Highlight is a must. I cannot get enough of this scent! I'm almost out of my Diptyque Candle, and I totally get all the rage over it. Cashmere Slippers. Yes, I just said Cashmere! Just thinking about them makes me want a pair. Gift these for someone extra special.